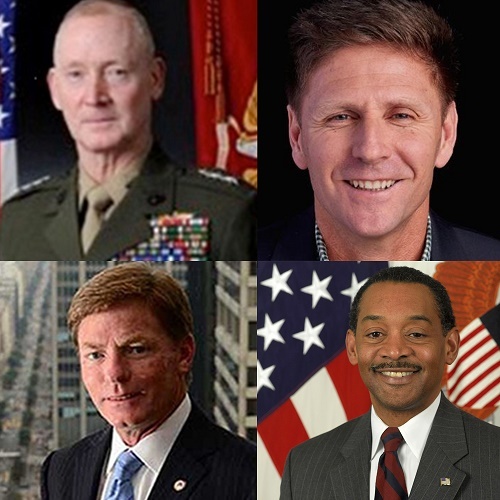 JACKSONVILLE, Fla. (Nov. 14, 2016) – Wounded Warrior Project® (WWP) welcomes to its board of directors four new members with the appointments of Lt. Gen. (ret) Richard Tryon, the Honorable Juan Garcia, Mr. Ken Fisher, and Dr. Jonathan Woodson, and plans to appoint additional members in the new year. Lt. Gen. Richard Tryon was commissioned as a second lieutenant in the Marine Corps after graduating from the U.S. Naval Academy in 1975. During his 40-year career in the Marine Corps, Tryon participated in Operation Desert Shield/Desert Storm, Operation Provide Comfort, and completed overseas assignments in Japan, Germany, and Iraq. He served as Commanding General 2nd Marine Division (Camp Lejeune), and Commanding General of the Multinational Force – West (Iraq). He also served as Commander, U.S. Marine Corps Forces Command and U.S. Marine Corps Forces Europe until retiring in 2014. Tryon is currently the Senior Fellow in International Leadership at the Hicks Honors College, University of North Florida. The Honorable Juan Garcia is the Global Leader for Career Advancement at Amazon, a company which this year pledged to hire 25,000 additional veterans and military spouses over the next five years. Garcia recently served as Assistant Secretary of the Navy (Manpower and Reserve Affairs) from 2009 to 2015, where he was responsible for all matters pertaining to manpower and personnel policy within the Department of the Navy (DoN). Secretary Garcia also served as a Democratic member of the Texas House of Representatives from 2007 to 2009. Garcia is a second-generation Naval Aviator who completed deployments in the Persian Gulf and the Western Pacific. He served as a flight instructor at NAS Corpus Christi, and continues to command a reserve unit at Naval Station Kitsap. Mr. Ken Fisher is chairman and chief executive officer of the Fisher House Foundation, where he oversees a network of 71 Fisher Houses in the United States, the United Kingdom, and Germany. The foundation houses more than 30,000 families each year, while their loved ones are treated at major military and Department of Veterans Affairs medical centers. Mr. Fisher is also a senior partner at Fisher Brothers, where he manages, markets, and leases a portfolio of more than 6.5 million square feet of commercial space around the country, including New York City and Washington DC. Fisher received the U.S. Army’s highest civilian honor, the George C. Marshall Medal, in 2009. In 2015, Fisher was chosen as an inaugural recipient of the Lincoln Awards, which recognize exceptional citizens who provide opportunities and support to American veterans. Dr. Jonathan Woodson is the Lars Anderson Professor in Management and Professor of the Practice at Boston University’s (BU) Questrom School of Business; Professor of Surgery at Boston University’s School of Medicine, and Professor of Health Law, Policy and Management at Boston University’s School of Public Health. Prior to returning to Boston University in 2016, Dr. Woodson served (since 2010) as Assistant Secretary of Defense for Health Affairs in the U.S. Department of Defense (DoD), where he was the principal advisor to the Secretary of Defense for all health and force health protection issues while ensuring the effective execution of the DoD medical mission. Dr. Woodson oversaw the medical readiness for all military medical services including the evacuation and treatment of those deployed during combat operations, those treated in worldwide military health facilities, and those entitled to medical treatment through TRICARE services worldwide. Dr. Woodson is also a Brigadier General in the U.S. Army Reserves. Prior to his time in the Department of Defense, Dr. Woodson served as Dean for Diversity and Multicultural Affairs, Professor of Surgery at the Boston University School of Medicine, and senior attending vascular surgeon at Boston Medical Center. Wounded Warrior Project would like to thank Mr. Guy McMichael III for his decade of service on the board of directors. A veteran of the United States Army, Guy McMichael developed a distinguished career of service over many years. A graduate of Harvard University and the University of Michigan Law School, Mr. McMichael enjoys widespread esteem within both the civil service and veteran communities. He began his career in public service as a deputy prosecuting attorney. He later served as General Counsel for the U.S. Senate Committee on Veterans Affairs, playing key roles in the enactment of 40 pieces of legislation to benefit America’s veterans and their families. Mr. McMichael served on the WWP board since 2007, helping oversee a time of unprecedented growth within the organization. He last served as vice chair before reaching his term limit this year.